Mega Man 10 is the game available today on Xbox LIVE, and is said to retain the classic gameplay, which of course is still pretty difficult. 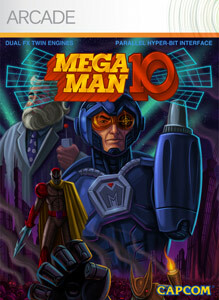 "Thanks to the support of all the fans, we at Capcom are proud to announce the release of Mega Man 10! Now fans of all ages can enjoy the newest entry into this historic 8-bit franchise. As a special service to new players, we added an Easy Mode - a first for a classic Mega Man game! We also have some special treats in store for all the fans. This time you can play as Proto Man and try out Time Attack Mode from the beginning. You can also watch play-through videos from players all over the world."